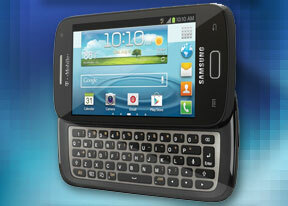 The Samsung Galaxy S Relay 4G runs Android 4.0.4 Ice Cream Sandwich, which has been heavily modified by the latest TouchWiz UI from Samsung. The lockscreen features a standard "tap and drag in any direction to unlock". Four customizable shortcuts are available at the bottom of the screen - drag one up to activate the specific app. There's one final cool but not so useful trick - you wake the phone (tap the power button or the home key), then press and hold the screen and rotate the phone horizontally. It will unlock and start the camera as soon as it's in the right orientation to snap a photo. We found that it's quicker to just keep a Camera shortcut on the lockscreen and use that. Once you make it past the lockscreen, you'll notice that the dock at the bottom of the screen fits five custom shortcuts or folders. The rightmost one opens the app drawer as usual, but you can change the other four to any shortcut you like or even a folder full of shortcuts. Moving on to the notification area - you get Wi-Fi, Bluetooth, GPS, Silent mode, Screen rotation, and five more toggles just off screen. You can scroll them sideways to reveal more functions. Following the ICS convention, the app drawer has a tab that lets you pull out widgets to the homescreen easily. Unlike stock ICS though, you cannot move between tabs by swiping through the pages - you have to explicitly hit the tab. Some will find this more logical as scrolling past the available apps to get to the widgets takes some getting used to. The app drawer has a zoomed-out overview too that lets you rearrange pages, but you can't create empty ones. Hitting the menu key reveals some more options, including hiding apps or enabling tap to uninstall mode. The app drawer has three view modes - Customizable grid (where you can rearrange icons freely), Alphabetical grid (if you think you can find apps quicker if their alphabetized) and Alphabetical list (this one makes shortcuts easy to hit, but isn't very space efficient). You can also view just the downloaded apps. There's a button at the bottom of the list to bring out Samsung's home-brewed task manager. This is the quickest way to clear up both the list and some RAM. Let's go back to the homescreen and the widgets. Ice Cream Sandwich comes with various widgets and Samsung have added more still. Some widgets are resizable too - a feature we've seen in some custom UIs is now available natively in ICS. To resize a widget, you tap and hold on it as if you're going to move it but after the phone vibrates, you lift your finger. Four handles appear that let you resize the widget in every direction. How much you can stretch/squeeze a widget depends on the widget itself - it will glow red if you've moved beyond the supported size. Live wallpapers are a great way to prettify your homescreen. Photo wall for example creates a collage of photos from your Gallery. You've probably seen our S Voice vs. Siri vs. Speaktoit Assitant post, but we'll recap our impressions of Samsung's S Voice here. S Voice understands English, French, Spanish and Korean, Italian and German. It can be activated by voice too - the default prompts are "Hi Galaxy" and "Hi Buddy", and you can add custom ones too. That makes for completely hands-free, voice-only control of the phone. Note that this puts a strain on the battery, but there's an option to activate this feature only when the phone is plugged into a charger. S Voice can do the usual - search the web, make calls, send texts (which Android natively supports and so does Vlingo), but you can also use it instead of the notification area toggles, to control the music player, look up weather and traffic info for a city, set timers and alarms (and snooze them too) or launch an app. Some apps get special treatment - for example, you can say "I want to take a picture" to activate the camera and say "Cheese!" to snap the photo. Facebook is another example - you can update your status using S Voice. Same goes for Twitter. It's also a tool for quickly looking up facts - it's powered by Wolfram Alpha. It has an enormous database covering topics ranging from Culture and Media to Physics. Unlike Siri, S Voice extracts only the relevant bit of info that Alpha provides and showing you more details only if you want them. One of the things that made a negative impression was that the speech to text transcription was somewhat worse than Siri (which isn't perfect either). S Voice understood the commands most of the time, though there were cases when it didn't quite catch our words correctly. S Voice also needs some polishing when it comes to removing unnecessary prompts - it asked for GPS to be active when checking the traffic in a city (even though we weren't in that city and it shouldn't matter where we are anyway), it stumbled when there were multiple numbers that an SMS can be sent to (it reverted to regular touchscreen interaction, forgetting we're trying to talk to it) and then it crashed when we tried a question just for fun. Still, if you look past its quirks, S Voice can be a handy tool in situations where your hands are occupied (especially while driving, when you can't take your eyes off the road either). In all other scenarios you will be much better off using your fingers than your voice. Things might improve in the future but we are still a few years away before such technology becomes an essential part of the smartphone user experience.